The church at Emborough is more than it appears at first glance; a Georgian restoration belies the ancient origins of the church, which may well date back to the Saxon period. The core of the present building is 12th century. 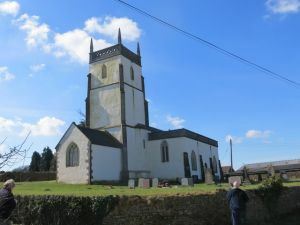 There is a sturdy, pinnacled central tower dating to the 13th century and the exterior style is a mix of Perpendicular and 18th century Gothick. The porch is 18th century and the interior fittings are primarily Georgian. One of the most notable features is the decorative plasterwork at the east end of the barrel-vaulted nave ceiling, with a frieze of interlacing vines, flowers, and sunbursts. There is more plasterwork vaulting under the tower. Look for a cast iron Gurney stove for comfort getting through long, cold sermons. The altar table predates the Georgian renovations; it dates to the early 17th century. The west gallery is Georgian, as are the pulpit and altar rails. There are 17th and 18th-century grave slabs set into the floor, and six 18th century monuments on the walls. The organ is 19th century, as are the chairs and pews. Emborough church is redundant and is cared for by the Churches Conservation Trust. It is normally open daily.